I have been writing a new application the last few days and ran into an issue. 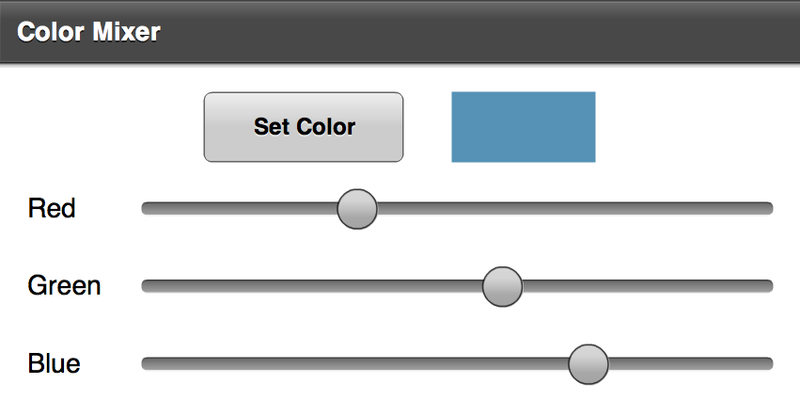 The old mx color picker has no counterpart in Flex Mobile Development. After some quick research, I decided to make a view that can be reused by others. (right-click on PC, Control-click on OS X and select "Save Target as..." or something like that). PS - this is my band's official web site so while you're there take a listen to our music! The controllers are simple Spark Horizontal Sliders that have ranges from 0-255. Each slider has a change event handler registered to the same function. The logic is included to lay these out for both portrait and landscape modes. A visual reference to the current color is represented within a Spark rect. 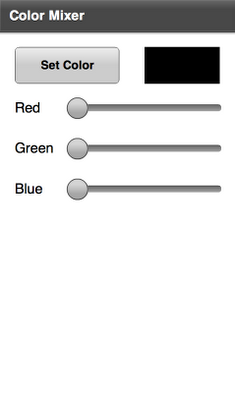 The Button calls a blank function to be used to take whatever action you want to set a color. As you move the sliders, the color changes. 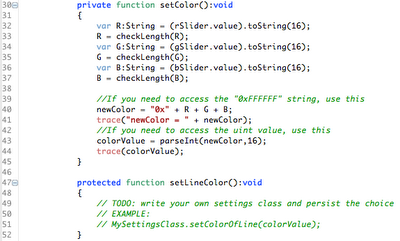 The setColor function does not return anything. 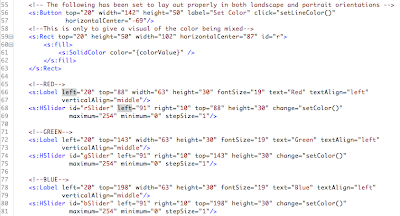 All it does is grab the values and convert them to be used either as Hex (for example, "0X0f3eff") or uint formats. 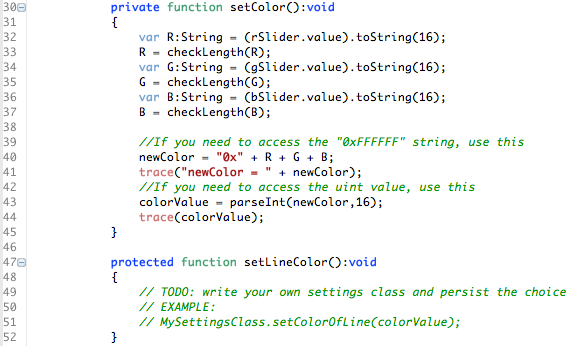 A click handler is registered against the button to set the color, which can be done from the setLineColor() function. A small utility class is used to prevent incorrect values from being written when ranges are less than one character long. The checkLength() function has comments and is self explanatory. This is to prevent '0f0f0f' from returning "fff" if the values are all 15. If you use this and find any way to improve it, please consider sharing via this blog post. This episode of Duane's World was filmed in Barcelona, Spain with Ben Watson. The talk focuses on Customer Experience Management (aka CEM) which is an emerging architectural discipline focusing on a customer experience view. While previous user experience (UX) work has been done by architects in the context of a single application, Customer Experience Management spans the experience over the complete lifetime of a relationship and over multiple channels of interaction (examples: telephone, email, web, in person etc). "How to Approach Customer Experience Management". Gartner.com. 2004-12-27. Debor, Jessica (2008-02-20). "CRM Gets Serious". CRM Magazine. Strativity Group (2009), 2009 Global Customer Experience Management Benchmark Study, Strativity Group, Inc.
Rae, Jeananne (2006-11-27). "The Importance of Great Customer Experiences". Business Week. Lopez, Maribel D. (2007-11-12). "Operators Thrive by Building and Enabling Experiences". Forrester. The new site for Adobe MAX 2011 is now live at http://max.adobe.com/. You can already register and will get a substantial break by doing so this early in the game. The early bird pricing ends July, 2011. If you have done something really cool in the last year using Adobe technology, consider applying for an Adobe MAX award. The MAX Awards provide an opportunity to gain industry visibility for you or your clients' projects. The contest will open on Wednesday, June 1, 2011 and close on Friday, July 29, 2011, at noon (Pacific Time). The categories for 2011 are: Advertising and Branding, Digital Publishing, Enterprise, and Entertainment. Finalists are selected in each category by the Adobe Judging Councils. The top three finalists in each category will be invited to showcase their work prior to and during MAX 2011 to support online voting for the category winners. Online voting will open one week prior to MAX, and the category winners will be announced live at MAX. Award entrants are also eligible for Honorable Mention recognition. The information you provide in your MAX Awards application will be used internally by Adobe for purposes of judging the awards and may be reproduced, publicly displayed, or used in press releases by or for Adobe for the sole purpose of promoting the MAX event and MAX Awards. 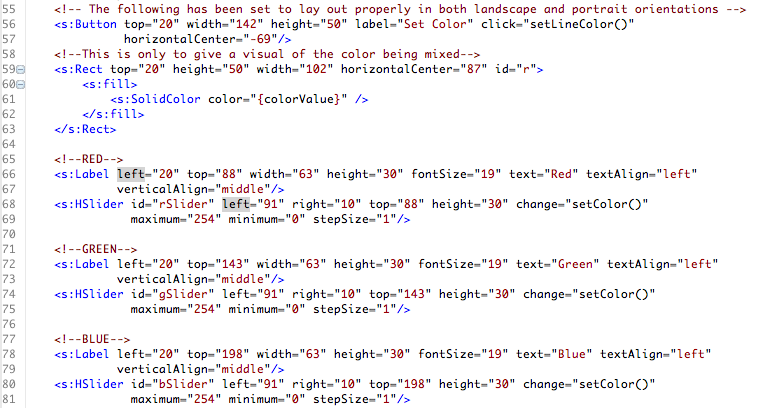 Your contact information will be used by Adobe only and will not be distributed or shared. There is also a Community Pavilion this year again. The Community Lounge offers a comfortable forum where designers, developers, and others in the Adobe community can mingle with peers, share ideas, and network. This is your opportunity to spend one-on-one time with these product experts. Unconference discussions are participant-driven presentations and discussions centered on a theme that are open to all. Attendees have the opportunity to sign up and present on topics of their choice. Last year these discussions were very popular. From project post-mortems to open panels, these discussions provide an opportunity for sharing and receiving information and connecting with your community. Multiple discussion themes similar to last year are in planning stages — stay tuned for more details on the Unconference discussions. Hang out in the MAX Playground and try your hand at the latest video games. If you prefer classic games, check out the retro area featuring cool games from the past. I'll be there! See you there!